I’ve already quoted the bard Yogi Berra a few times here on the blog, but one my favorite Berra-isms is “you can observe a lot by watching.” I was reminded of this saying by a new post at Election Updates by my friend and colleague Charles Stewart of MIT regarding his observation of polling places in the recent Boston mayoral primary. I spent [Tuesday] visiting five different polling places in Boston (one of them twice), during the preliminary mayoral election. I chose the precincts randomly, though I used a method that assured me I would hit some big-registration precincts and some smaller ones. One of the things I did was sketch the layout of each of the precincts I visited. I’ve attached cleaned up versions of those sketches to this posting (using that great drafting package, PowerPoint) [example above, others available at the bottom of his post]. As my geologist spouse would require me to say, these are not to scale; however, the sketches that look the most crammed together were the most space-constrained. I haven’t identified the precincts, because that’s not important. What is important is the variability. (1) Local officials frequently remind us that they do not own the spaces they use, which was definitely true here. (The point was driven home when the building owner of one polling place decided to start power-washing the building, directly over its entrance, right as voting began.) These were all brightly lit, safe, pleasant spaces, but none was optimized for voting. (2) The amount of space available for the voting equipment was loosely correlated with the amount of business or amount of equipment. As a corollary of point (1), sometimes the best available community spaces required the city to cram a bunch of equipment together. 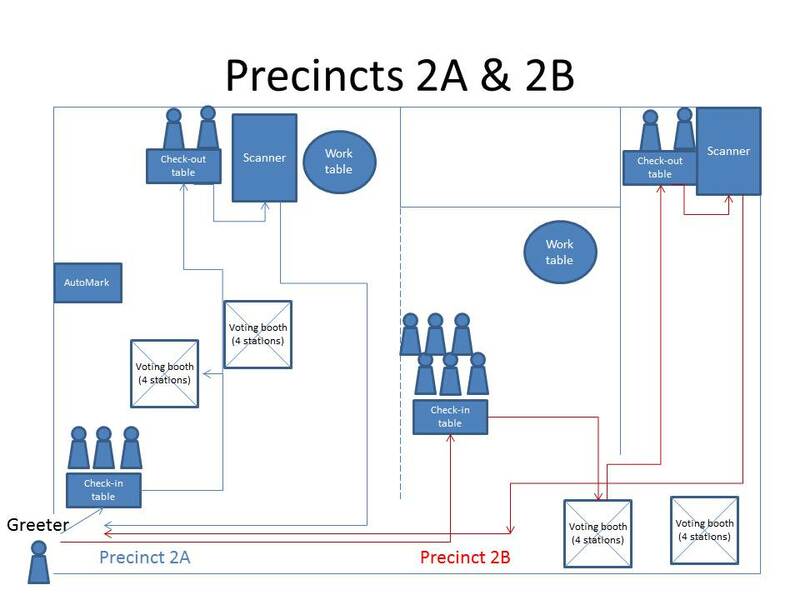 (4) Not shown here: the gaggle of a dozen reporters/campaign workers who swarmed into “Precinct 1″ right as polls closed, looking to get the results as soon as they were printed off the scanner. As far as they were concerned, this was party time. They seemed little concerned that the poll workers were trying to do the very exacting task of checking their work and closing the precinct in an orderly fashion. I can only imagine what the campaigns would have said/done if the precinct workers had gotten something wrong in the close-up — but, it’s not like their representatives on site were really concerned about the fact that the poll workers still had a job to do. Charles’ post is important for a number of reasons (powerwashing? REALLY?!) but I think it’s significant for a reason that Yogi Berra would appreciate – namely, that observational data is just as important as other information in assessing what works and what doesn’t in election administration. Observation gets a bad rap, in my opinion, because it usually ends up being associated with either the spectre of polling place challenges to voters or is the basis for random anecdotal evidence that can obscure underlying trends and truths. What Charles did this week – and what I think more researchers should do across the nation – is augment traditional sources of election data like surveys and reported returns and statistics with observational data that puts the other information into a real-world context. Kudos to Charles for his one-man expedition – and here’s hoping it inspires others to attempt something similar in other communities. To paraphrase Yogi, you can’t observe what you’re not watching. Be the first to comment on "You Can Observe a Lot By Watching: Charles Stewart on Polling Place Design"